The Wargame Addict: It's Good To Be Back! Great to have you back posting Greg, a very nice haul from your birthday, the test of honour figures look great. You`re very welcome, its a great game and you will have a lot of fun with it I think. Really great to hear from you Steve, and I hope you and Hils are both doing well! I have missed your posts recently, Greg, so it's great to have you back. I very much look forward to seeing what you do with "Test of Honour" - a game I'd love to play myself. I have two questions for you regarding that last picture. Who makes the guy in the long coat? I recognise the three street walkers but not him. And, where does you scenery come from? It looks very effective. I've thought long and hard about "Test Of Honour" since its release, and finally decided to take the plunge! Much appreciated, Greg. I am very tempted to buy those Infinity scenery sets to use for my Judge Dredd games. What do you think of them? Would you recommend them? I'd recommend them 'at the price' (ie I think they're cheap-n-cheerful). The set is basically two sizes of fold-up boxes and a pair of fold-up walkways, plus a double sided poster / game mat. The design and decoration are quite well thought out, and the "Neon" colours make for a nice contrast to the greys of the 'rest of the city'. Well great to have you back too Greg! Really looking forward to seeing how you get on with Test of Honour, but I need to ask who makes the splendid ladies in the Blade Runner picture? Hi Michael, (and fellow returnee!). An addiction is a terrible thing. Hahaha who am I kidding. Great to see you getting into another period. It's good that you're back. Thanks Tim - it's not really been a long layoff, but it's seemed like AGES! I concur it's good to have you posting again. Samurai, sorry to get you going on another project and looking forward to see it progressing, thanks for the mention as well. You've got so many interesting things going on it's difficult to know where I should like to see you progress next. I'm curious about the Blade Runner aspect, you've hinted at it but I've not seen much here, what are you thinking of using for rules and background. I've only seen the film a couple of times but the scene eating noodles in the rain has quite an oriental flavour if I'm remembering it rightly. The Bladerunner games are going to be set between the original film and the new "2049" (including the 'prologues' Nexus Dawn, Nowhere To Run and Blackout). The 'main' rules will be the unofficial Blade Runner rpg by Jonathan Hicks, and The Department noir investigation skirmish by Joseph Dragovich. Those market stalls sound interesting, are they from one of the mdf terrain suppliers? I'll look out the rules you reference - thanks. The stalls were Sarrisa I think. They do two sorts, I bought both, a geisha cart, some lanterns and they came with a measuring stick which was for Test of Honour. So maybe they are the official scenery! I've only opened the cart which is nice but the poles to pull it are set very wide apart. Hi Greg I've just been reading about The Department Rules and they sound interesting. IveI often thought about gaming detective fiction - you know the sort of thing Raymond Chandler, Micky Spillane Dashill Hammer, and these sound as if they might do that. A sort of Cluedo on steroids and solo. Have you used the rules and do you think they would work for clue gathering and detection, solo without a GM? I'm quite happy to use ANY rules solo (though some are obviously better than others), and from the read-throughs I'm confident they'll work - I'm also very sure they can be modified by having some Two Hour Wargames mechanics (like PEF's etc) 'bolted on' to them. Ok - mail sent. Thanks I'll try and pick it up tonight. I can fully understand why you'll wand to stick with Bushido Andy, especially after building up your excellent clans for the fantasy-orientated game. Glad your heating and plumbing is sorted (finally), as with my own, it's no fun at all and puts a serious dent in one's hobby activities. 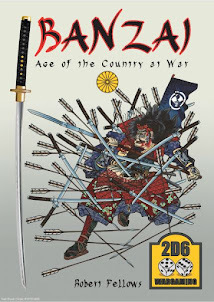 I dabbled in Samurai skirmish games many years ago and couldn't find (or write) a set of rules that I liked or reflected the period, so I'm looking forward to seeing your birthday swag inaction! I've only done Samurai 'battles' and rpg in the past - I'll gloss over my box full of Legend Of The Five Rings cards ;-) so I'm REALLY looking forward to skirmish gaming. Nice to see you posting again. Loving the ladies of the night. I look forward to seeing your ToH stuff I don't have the room for it but it has some ace figures. I'll be tackling the ToH painting as soon as I can clear the decks, and yep, I'm impressed with the mini's so far!